But Only 1 of them Has Dedicated Themselves To Responding To Your Emergencies Quickly, Offering Immediate Solutions To Your Problems, Providing Qualified & Guaranteed Work, While Properly Communicating With You Throughout The Entire Process! If you are planning – or just thinking about – fixing or replacing your roof, getting restoration work done on your building, or if you would like to know who to call that can respond to your emergency situation within 5 hours… we would like to show you a way that you can have a roofing or building repair experience without the run-around, hassles, budget worries, and surprises that are much too common in our industry. 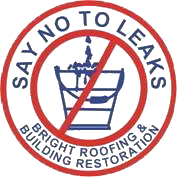 The Four Biggest Problems You’ll Have With A Roofing or Restoration Company And How Bright Overcomes Them All! Unreliable response time and accountability during an emergency. Not fixing the problem right the first time. Poor communication by the company throughout the project. Contractors who misrepresent their capabilities. If a company fails to live up to its end of the bargain in any or all four areas, we can almost guarantee that you’ll have a miserable and frustrating experience. But there is a way you can avoid this frustration.